Camden Sedgebrook, located in Huntersville, is the perfect balance of relaxation and recreation! Our fantastic location places you steps from the dining, shopping and entertainment of Birkdale Village, minutes from Lake Norman and convenient to Uptown Charlotte. In addition to an amazing location, our one, two and three bedroom apartments and townhomes include stainless steel appliances, maple wood cabinets, walnut plank flooring, gas log fireplaces and walk-in closets. 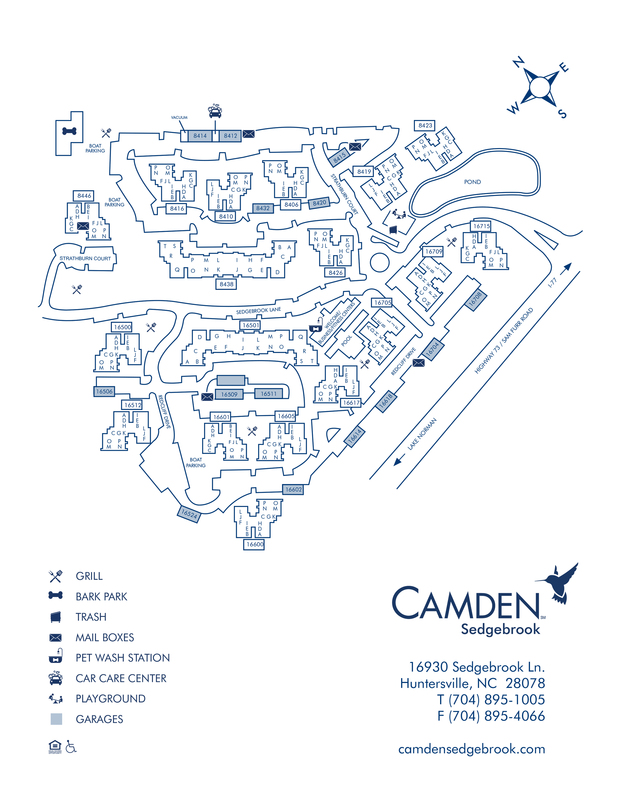 At Camden Sedgebrook, we focus on easy living providing you with conveniences like doorstep trash pickup, a washer and dryer in most apartments, optional garages, extra storage and complimentary boat parking. Steps from your door you can relax by the saltwater pool with WiFi, break a sweat in the fitness center with free weights and cardio equipment or get some work done in our resident business center. We know you’ll love it here almost as much as Fido! Our dog park with agility equipment should be your second stop after you visit our team for some pet treats! Additional amenities include outdoor grill areas, clubhouse, playground and car care and maintenance center with vacuum and air compressor. Camden Sedgebrook is currently in process of becoming a completely non-smoking community. When it’s time to explore, Camden Sedgebrook is located off I-77. That makes it easy to get to events at Spectrum Center, Bank of America Stadium, and Uptown Charlotte. Life is easier at Camden Sedgebrook - schedule an appointment today and experience life at Camden Sedgebrook firsthand. At Camden, your pets are family too! We welcome cats and dogs, up to two pets per apartment home, with a full-grown maximum weight limit of 85 pounds combined. Call us with any pet-related questions! Get the perfect spot! We have ample open parking for our residents and Visitors on a first-come, first-served basis. Garages are available for you! We have Detached Garages which are 11' x 22' in size and are $100 per month.